Every year we host a 4th of July Pool Party. 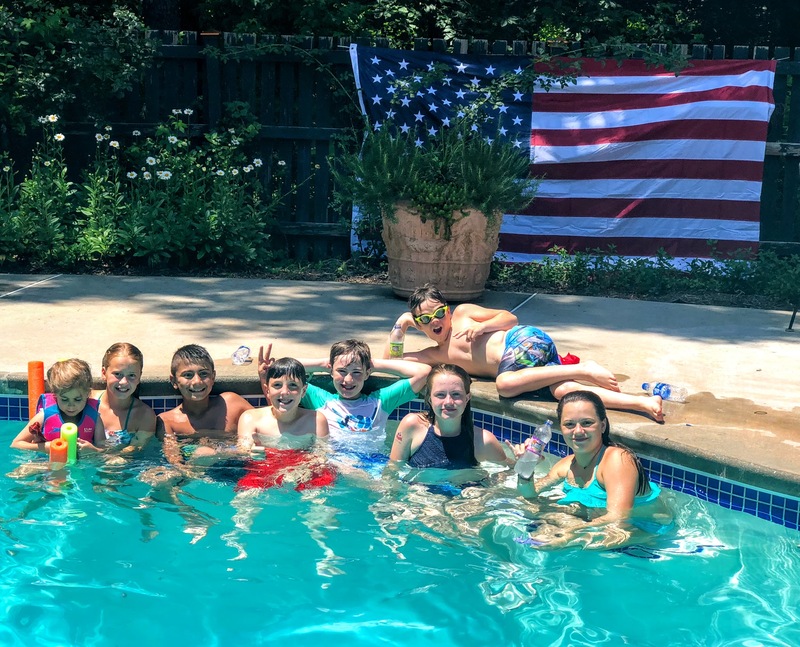 We all go to our local 4th of July Parade in the morning and then friends and family gather at our house for a 4th of July picnic and pool fun. Decorate your pool gate with a simple Fourth of July flag like this one. 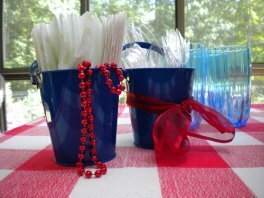 Place flags in planters and hang red, white and blue paper lanterns from the umbrella ribs. 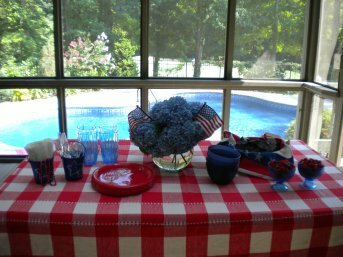 It's easy to set a 4th of July theme with some simple red, white and blue plates and napkins and a couple of flags. Every family brings a salad or a dessert which makes it easier for everyone. Some years we have grilled hamburgers and brats and other years we have served cold sandwiches. 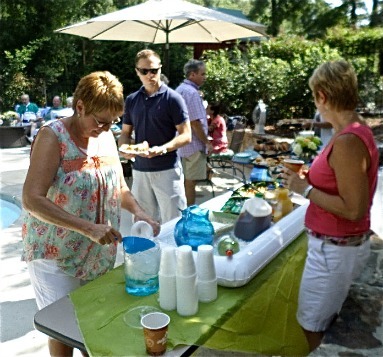 Start with a blue or red checkered umbrella tablecloths for your food and party tables. 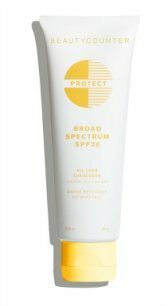 I have several of the red ones and use them all summer long. I found these cute blue buckets at the dollar section at Target. Use them to hold your utensils and napkins. Tie a red ribbon around the buckets or adorn with red beads. Keeping food cold is a challenge for any 4th of July party. We often have guests coming over a several hour period. I wore myself out putting food in the fridge, taking it out, putting it in the fridge - well, you get the idea. We love this inflatable cooler (with a drain) - fill it up with ice and then put your drinks, bowls of salad, or trays of fruits on top of the ice to keep foods cold. A rolling beverage cooler allows you to place your party cooler anywhere you want. No lifting or carrying or if the sun gets too hot, just roll it to a shadier spot. Have a dozen red, white and blue beach balls floating in the pool for your 4th of July pool party. 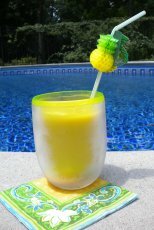 Not only do they make for great pool decorations, but will add lots of fun to the guests pool time. We find that everyone loves to toss them around engages kids and adults. Pennants provide the biggest bang for the buck. They provide lots of color strung around the pool party area. I love that the vinyl ones because they can be put up ahead of time and unlike paper decorations, it doesn't matter if an unexpected rain shower pops up. Have a couple of red, white and blue swim rings floating in the pool for decorations and for games and fun. These are nice and large - 36" and made of durable vinyl. Get a couple of them so there are plenty of floats for your guests. 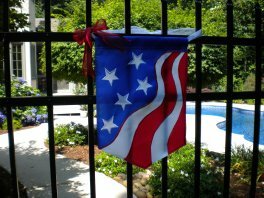 Hang a stars and stripes fabric bunting along the pool fence or one on the pool gate. It measures 4' and is made out of polyester fabric - which means it can be used again and again. 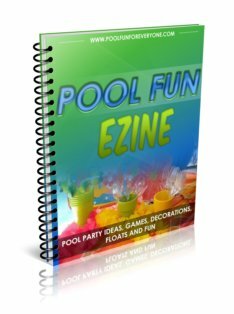 Unlike paper decorations it can get wet from pool water splashes or rain. Three grommet holes make it easy to tie onto any location. A reminder is sent to the guests a couple of days prior reminding them of the event or letting them know that they have not RSVP'd. For several year I simply invited our friends via a telephone call. Not any more. One year we had 30 people at our annual 4th of July pool party. They started coming at 11:30 AM with the last guests arriving at 6:30 PM. Needless to say the food went in and out of the fridge and in and out the microwave all day long. A written invitation with a specific time that the party starts and what time the food will be served (Food will be served promptly at 1:00 PM) has helped to "control the crowd" so that they are now all coming about the same time. Add a few star sprinkles to the envelope for an extra festive touch. Let it sit for at least an hour. I make it the night before. It is so light and refreshing and looks so patriotic. 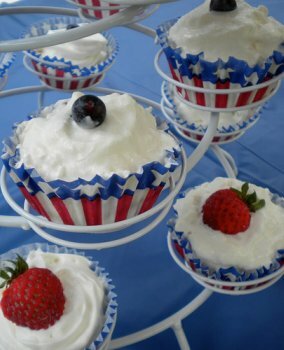 Fourth of July desserts look quite festive in these red, white and blue cupcake liners. These baking cups were purchased from Tuesday Morning last year. I found this cold dessert recipe in a magazine. Make the dessert ahead of time and freeze it. Serve the treats in a cupcake stand for a creative display. Beat cream cheese until creamy. Gradually beat in milk. Add dry pudding mix and beat 2 more minutes. Stir in Cool Whip and strawberries. Spoon the filling into the cupcake liners (place the liners in a muffin pan for a better shape - you can remove them after they become solid). Remove them from the freezer just before serving as they soften really quickly in hot weather. 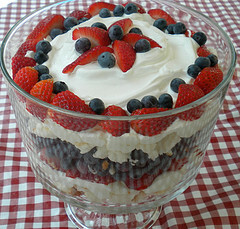 Top with a dollop of whipped cream, blueberries or strawberries. We use these acrylic wine glasses for more than just serving wine. See how beautiful this Fourth of July dessert looks in them. Keep them cold in the fridge until it's time to serve dessert. For something so simple, this cold dessert looks really great and tastes good too. Of course I love any dessert that has Cool Whip.